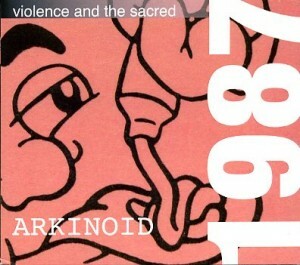 “Arkinoid” was original released on cassette by Sound of Pig in 1987 and like that year’s “Lost Horizons” was recorded live at The Fallout Shelter, although 2 months earlier. Given the close proximity in time, stylistically these two releases are fairly similar, as well as both improvised. Again the quartet uses synth, beatbox, tapes, cello and guitar with the mysterious St. Deborah’s prerecorded voice. Here the narration pulls from Samuel Beckett and Alfred Jarry. The majority of the disc does focus on instrumental passages, but overall does not strike me as significantly different from the previously reviewed “Lost Horizons”. Most of what is said there also applies to this disc. “Arkinoid” does features a bonus track recorded later that summer at Kathedral A which was previously released on the cassette compilation “A View from Somewhere” along side fellow Canadian artists Wigglepig, Sucking Chest Wound, Electrostatic Cat and John Oswald, among others. Because of its similarity, although here using Friedrich Nietszche as a text source, it seamlessly fits in with the rest of the disc. This would seem to replace the October 23, 1986 recording that was featured on the original cassette as the disc’s total time is around 51 minutes. As with others in the series, this comes in a colorful Digipak reproducing portraits of the text’s authors, the original cassette artwork, a section of the original flyer, and a trio of video stills.